The WORCESTER PARK Blog :: Faking the headlines? I have been tempted, I admit, at times to turn to the Surrey Comet when blogging fodder is a little lean and I'm running short of local inspiration. Now the worm, it appears had turned. A few days ago, I blogged a largely tongue-in-cheek piece about the Low Emissions Zone and how it cuts Worcester Park in half. An insignificant piece of local information, which makes no real difference to anyone (as confirmed by the singular lack of response to this blog piece). "The next time you are in Central Road stand and take in the sweet perfumed low-emission, early-spring air outside the Halifax Bank. Then, cross (at your own peril) to choke on the rancid fume-filled air. Beeeg Eeeshoo, amigo? Who knows - perhaps being in the zone will inflate house prices even further." Now, I value the intelligence of my readers so I'm assuming I do not have to point out that the piece was very much cast in a satirical hue. The air on one side of Central Road is not going to be chokingly fume filled any more than the air on the other side will be fresh as a spring meadow. Surely nobody would have been gullible enough to take this bit of blogging seriously? Well, apparently they are. 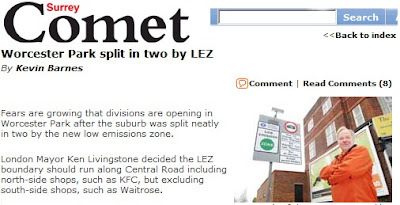 "Fears are growing that divisions are opening in Worcester Park after the suburb was split neatly in two by the new low emissions zone." the paper bleats alarmingly. Oh dear, irony lost on them. Then they go on to quote 'the author of one local web log' (my good self). To compound their own non-story, they then analyse my quip about house prices going up in the non-polluted side of Worcester Park versus the potential cost increase from removal firms surcharging because of the cost of compliance with the LEZ. "Local people seem agreed on one point: Worcester Park could slowly become polarised. Rarely has a settlement known such fear since beachside apartments sprung up beside the sprawling slums of Rio de Janeiro." (b) The recent the spate of alien abductions from the car park of Waitrose in Worcester Park.